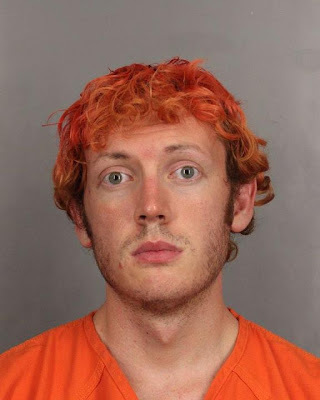 So will James Holmes be able to use the "insanity defense" if he was already under the care of a psychiatrist, and was being prescribed drugs for his mental condition? And another question surfaces - is James Holmes responsible for the massacre - or the people who were feeding him the drugs? The government has made every possible disqualification roadblock to prohibit gun possession. A person taking certain legally prescribed drugs like medical marijuana. People suffering from Post Traumatic Stress Disorder and depression are often precluded. One incident of depression that was perhaps 35 years past with no relapse may prohibit gun possession for life. Holmes was under the care of a Psychiatrist at the University Medical center. Most likely that came from his exhibiting psychotic behavior that resulted in his being transported to a hospital. If a single physician determined he needed to be held for observation even for a day he’d be disqualified to own a gun for life even if he was later determined to be fully recovered or healthy. It’s unlikely Holmes could avoid being disqualified from gun ownership because of the way the law is written. As for Holmes and any sanctuary he’d enjoy for mental defect it is anyone’s guess how this would play out in court. I’m wondering if Holmes was a mind control victim acting under some post hypnotic suggestion. Considering his area of study that needs to be fully examined. With mental illness and the so-called criminally insane we’ve not made much progress beyond when Daniel M'Naghten attacked Sir Robert Peel so long ago and far away. Today we have found ways to stabilize patients with wonder drugs. However the moment they fail to take the drugs they return to the danger zone. I expect the long established law related to Daniel M'Naghten, will be no small part of James’ criminal defense. I think there is much more involved here and perhaps a conspiracy to create a crisis that would trigger government action to restrict liberty. The signs of a post hypnotic suggestion are present because the emulation of “the Joker”. James would not want to do anything that outrageous on his own. If he somehow became convinced he was in fact the Joker he perhaps could be programed to do the Joker’s evil deeds. The key to this is to look carefully at others associated with James’s school projects especially within the faculty. I’d be shocked to learn that none of them have ever studied mind control or worked for the government on various projects. The parents of this lad know for sure if there were signs indicating violence in his life. Somehow with an absence of a criminal past I seriously doubt there were signs leading to this magnitude of trouble. I smell a rat here considering our president had a Chief of Staff who proclaimed to, “Never let a good crisis go to waste.” When you add to that they channeled many thousands of tax dollars to known felons clearing them to buy guns intended for delivery to Mexican drug cartels, anything is possible. We now know hundreds of Mexicans along with two of our own federal agents were killed by those guns. The obvious propaganda motive was to garner support for Gun Control that’s lost its popularity. In any event every angle of mental health investigation will be explored. No matter what there are people want anyone committing a murder to pay the ultimate price and refuse to forgive on account of mental illness. Many will accuse Holmes of faking. None of us will ever know for sure what drove Holmes to this senseless act. What is the Colorado University Denver hiding? About 11 hours after the attack, Barry Shur, dean of the graduate school at the university, sent an email to faculty, students and staff saying: "If anyone is contacted by the media, PLEASE refer them" to a school spokeswoman. Shur's email was released in response to an open records request from the AP. Earlier this week, Shur denied trying to prohibit those who knew Holmes from talking. "We told them they are fully free to interact with the media," Shur said at a press conference Monday. So Barry Shur of Colorado University Denver is a complete hypocrite, and would fit right in at Penn State University in covering up. CAUTION: the first link above link has a way of destroying text/ info to be sent - it destroyed my comment for this blog first time - so looks as if I am really correct and the Court Joker in Colorado wants to stop info from getting out to the American public where that information belongs! Paul said "Today we have found ways to stabilize patients with wonder drugs. However the moment they fail to take the drugs they return to the danger zone." I am not sure that the notion of wonder drugs is actually true. Some psychiatrists say that anti-psychotics plus other psychiatric drugs are a scourge on the human brain! Drugs, Electroshock, and the Psychopharmaceutical Complex"
Peter Breggin believes that all psychiatric treatments—drugs, electroshock and lobotomy—have their 'therapeutic' impact by disabling the brain. These brain-disabling interventions are then considered effective when the doctor, family, patient or society views impaired brain dysfunction in the target individuals as a desirable or beneficial effect. "'Antipsychotic' drugs such as Risperdal, Zyprexa, Seroquel and Geodon are used literally to chemically lobotomize millions of children and adults because the resulting apathy and indifference are seen as an improvement over their previously distressed and distressing state of mind or behavior. Millions more take 'tranquilizers' like Xanax, Ativan, Klonopin and Valium, suppressing their overall brain function in order to reduce feelings of anxiety. Many children have their spontaneity reduced or even crushed by stimulant drugs such as Ritalin, Concerta, Adderall and Strattera, causing them to become more docile and more obsessively attentive to rote work. Antidepressants such Prozac, Paxil, Zoloft and Cymbalta have no scientifically demonstrable effectiveness and are proven to cause suicide, as well as violence and mania. They too 'work' by causing mental disabilities such as apathy and euphoria that are misinterpreted as improvements. Meanwhile, their continued use is determined in part by the fact that withdrawal produces severe psychiatric symptoms, including anxiety and depression, so people can’t stop. "All psychiatric drugs have the potential to cause withdrawal reactions, including the antidepressants, stimulants, tranquilizers, antipsychotic drugs and 'mood stabilizers' such lithium. When the individual’s condition grows markedly worse by stopping the psychiatric drug, this is almost always due to a withdrawal reaction. However, people think that this is evidence that the individual 'needs' the drug even more, when in fact he or she needs time to recover from withdrawal effects. "People commonly use alcohol, marijuana and other non-prescription drugs to dull their feelings. Usually they do not fool themselves into believing they are somehow improving the function of their minds and brains. Yet when people take psychiatric drugs, they almost always do so without realizing that the drugs “work” by disrupting brain function, that the drugs cause withdrawal effects, and that they frequently result in dangerous and destructive mental reactions and behaviors. "Most consumers of psychiatric drugs do not realize how much these chemical agents disrupt the function of the brain and mind. As a result, their treatment in effect becomes involuntary. Many other adults are physically forced to these drugs in hospitals and even under outpatient commitment that allows for enforced drugging in the home. Because children cannot control their lives, they are always involuntary participants in these brain-disabling treatments. "Electroshock provides a more obvious illustration. In many cases, family members should intervene to stop all kinds of destructive “treatments”, which MAY happen if the family is savvy, and/or cares about their family member. But it also true that that intervention MAY NOT be forthcoming. "Anthropologists have conjectured that the evolutionary triumph of homo sapiens over other bipeds may owe more to our penchant for violence than to our intelligence. History seems to confirm that most organizations of human beings- from tribes and nations to churches and professions will tend to use force to achieve their ends unless someone stops them. Unfortunately, too few people seem interested in stopping organized psychiatry's thirst for coercive power which is once again on the increase. Whenever a "former mental patient" commits a seemingly irrational crime, organized psychiatry raises the flag of fear about psychiatric patients and uses it to justify forced treatment with drugs." Billions of dollars are riding on the drugs Dr. Lynne Fenton may have prescribed to her patient, James Holmes, the accused Batman shooter. And when billions of dollars in potentially lost revenue are hanging in the balance, the interested parties take action. They’re serious about their money. They don’t screw around. Then Congress holds hearings to look like they’re doing the right thing. And at those hearings, all sorts of nasty stuff comes out about Prozac, showing the drug was dangerous, that it could and would cause people to commit suicide and homicide. Boom. More bad press for the pharmaceutical company. More investigations. More lost revenue. So right now, in Aurora, there are pharmaceutical people on the scene. Not just low-level goofballs, but competent investigators. They want to know what drugs James Holmes was prescribed. They need to know. And behind the scenes, people with clout are making phone calls. These pharma types are talking to government agents and it’s crazy time and damage-control time, and nobody is laughing. This is a high-stakes game. WHAT DRUGS WAS HOLMES TAKING? There is pressure on both attorneys in the case, too. And the cops. With an insanity plea lurking in the wings, Holmes’ medical records could very well see the light of day. That would let everybody know what the drugs were. So somebody is calling the governor of Colorado, and other state officials, and they’re trying to maneuver and manipulate the legal process, to make the medical records vanish. Come on. This isn’t just a murder case. Now it’s about money. Big pharma lawyers are reading up on Colorado law to find loopholes, ways to get around revealing Holmes’ medical history. Holmes is now a pawn, who is going to be shuttled around on the game board to save the drug money for the people who own it. The money is dirty. It always was. It’s been made on the backs of people who have died at the rate of 100,000 a year in the US alone. That’s a million people per decade—pharmaceutically caused deaths. If they could get to Holmes in his cell, they’d erase him. They’d make it look like a suicide. Today. What do you think “lone shooter” is all about? Yes, the covert op that very well may have used Holmes as the patsy, to push the government into banning guns, is a major piece here. But that work is done. Now it’s “lone shooter” because getting rid of Holmes by killing him or warehousing him for the rest of his life in a mental prison, with brain-hammer drugs making him into a vegetable, means that the names of the psychiatric drugs he was taking before the massacre will be lost to history, and no one will take the criminal investigation any further. Update: Holmes’ psychiatrist, Lynne Fenton, was reprimanded by the Colorado Board of Medical Examiners, in 2005, for prescribing drugs to several patients, including herself, without entering the information in patient records. She could now find a target painted on her back, as the drug companies try to make her a patsy, an “irresponsible and incompetent doctor who didn’t give Mr. Holmes what he truly needed.” They would do this to take the drugs off the hook. “In the hands of a good psychiatrist, the proper medications would have worked well.” Who knows? Maybe they’ll claim she didn’t even treat Holmes directly, but supervised interns or grad students, who actually worked with Holmes. In the U.S. Vicodin is a Schedule III drug. Schedule III drugs are classified by the U.S. government as having the potential to cause moderate or low physical dependence, or a high psychological dependence if misused. Vicodin, made up of Hydrocodone/paracetamol is used to relieve moderate to severe pain. the National Institute on Drug Abuse explains that hydrocodone and similar drugs affect places in the brain associated with pleasure. Repeated abuse of hydrocodone can cause an individual, like James Holmes to become psychologically dependent on the pleasurable feeling obtained by Vicodin's use. This can lead to seeking out Vicodin from multiple doctors or purchasing it illegally as a street drug, but James Holmes may not have had to go to too much trouble in obtaining Vicodin, as he might have been able to obtain enough easily from the psychiatrist at Colorado University. James Holmes, psychologically dependent on hydrocodone, may have continued its use despite severe legal consequences including despicable destruction of innocent people, and damage to his own life, career and relationships. Yes we can continue to ask - what came first - the chicken or the egg? However the explosion/the massacre may have been the end result - a fusion between the drug and Holmes.